I began collecting notes on wood when I began my first guitar build, in 2005. Having always been a lover of wood (my father built furniture when he retired and we did projects together when I was a kid), I found the entire subject fascinating: the difference in looks, handling, and the sound resulting from various species of wood. Since I had distinct ideas about what I wanted and was willing to consider almost anything that would get me there, as was my luthier, I began to research. The more I looked, the more I found. The computer was necessary to keep it all straight. Then came other builds. More information. Finally I decided to just see what all I could find, someone told me to make it public, and here we are. It is an amalgamation from all over, but mostly from the internet. I began to assemble things and put them in a meaningful order with no thought of doing this for anyone but myself. This means I did not keep track of who to attribute the many quotes and pictures to, or even where I found them. My apologies; this is something that I regret. You all did the work and I did the assembly. It’s you who are the experts and deserve the credit. ﻿Having given these disclaimers, let me add two others. Far more important than the choice of wood is the person who does the build. Two luthiers, working from identical wood, on the same size guitars, may produce results which can vary strikingly. It is a little like 2 artists using the same color paints and producing different paintings. It has even been said that in the choice of wood, you are primarily selecting for looks. Going further: two pieces of the same species may exhibit different characteristics; subjected to a Janka test, they may not produce the same rating. We do a lot of talking in generalities here. That said, there are some predictable results which do affect nearly every build and, yes, there are real differences between woods. During the course of my research, I have found different luthiers sometimes claim quite different properties in the same species. This is hardly surprising. Each piece can be different - as is each luthier, as well as their approach to handling wood and their experiences. So, you will read some conflicting opinions. So it goes. Most of the woods here are considered appropriate for the back and sides of stringed instruments. 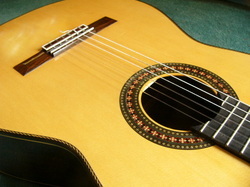 Mixed in, however, is a far smaller list of those considered suitable for the tops (designated by an *), and an even lesser number, for fretboards, bindings, bridges, and necks. For some of these, there is a great deal of information. For others, it is scarce. There are a few listed here which I know are sometimes used for instruments but on which I have not found out much of anything - not yet. I have used pictures when I found them. When there were ample choices, I opted for the more spectacular, to show what can be achieved. There can be great confusion over names. It is probably perpetuated here, sorry. It seems that some woods are known by different names and there are even cases where different woods share the same name. I have given Latin names where I ran across them and have added alternate names in the same way. Scientists argue over these things too. As boards, they're not always easy to tell apart. It's hard enough when they are trees. My efforts have concentrated upon woods used in hollow-bodied acoustic guitars. There is a great deal of information out there on solid-bodied instruments as well, but close attention was not paid to that. While the focus is upon guitars, much of what is written here can be applicable to mandolins, ukes, and other wooden acoustic stringed instruments. Lastly, with over 200 different woods, this is a continuing project, one that may never be complete, and your comments and corrections are welcomed, as well as any additions or suggestions you may have. I have quoted freely and often without attribution and, with your help, can correct that. Often identical wording was found in several web sites; God knows where it originated. Sometimes I have paraphrased and at other times added my own observations. It’s all mixed together, just like the pictures are. They came from many, many sources, including my own instruments. If you see something in here that is yours and you want recognition or want it removed, please just ask me. There was no intention of injuring anyone or their feelings. I have nothing to sell: my hope is simply to provide a service for the good people who build and play fine stringed instruments.